SRUTI LAYA: Sangeeta Jnanamu Bhakti Vina.... is the Bhakti aspect of Carnatic music dwindling today? Sangeeta Jnanamu Bhakti Vina.... is the Bhakti aspect of Carnatic music dwindling today? 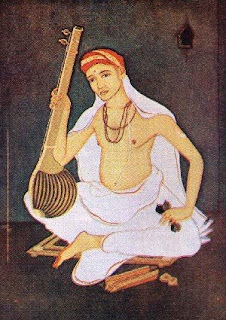 Saint Thyagaraja, one among the “Mummoorthigal” or the Music Trinity of Carnatic Music, is universally loved by Carnatic musicians and students alike. Not for nothing is he celebrated as a Saint and a Parama Bhakta of Lord Shri Rama. While his compositions touch the heart, owing to their utter simplicity of language and bhakti rasa flowing throughout each kriti, what makes this saint composer so special is that he actually aimed to educate students and musicians on the higher values of life, through his compositions. “Sangeeta Jnanamu” in Raga Dhanyasi is one such composition. Herein, Thyagaraja makes a clear statement in the very first line itself, “Sangeeta Jnanamu Bhakti Vina Sanmargamu Galadey”, which means, “the mere practice of music without the aspect of bhakti or devotion entering the craft, will not serve as a means to true mukti or liberation”. Indeed, music is the finest among fine arts and practising it with sincerity and total devotion bestows a high state of spirituality on the seeker, letting him get a glimpse of true “Sangeetananda”, enabling him to rise above the mundane, giving him true and lasting happiness. The problem that plagues this field, though, is that students today, merely seem to be learning and reproducing these compositions, without trying to delve into the deep inner meaning and understand that compositions such as the above were meant to be learning experiences in life itself. Competition is on the rise everywhere and with it comes bickering and other related problems. The result? No artist is finally able to find that true peace and joy with the practice of this great art. Some genuinely talented upcoming artists are pulled down mercilessly and have to struggle merely to keep their chin above the water. There are yet other instances where students are subjected to the same treatment in spite of having no particular ambitions of “becoming popular” or “famous” in the field; who practise music only to discover that true peace and joy. Why is there so much insecurity, so much sadness in this Carnatic field? After all, this is a divine art and needs to be nurtured to flourish in all its glory. This priceless gift from our Purvajas (forefathers) desperately needs to be preserved. Students of music need to be made aware of the unique aspect of bhakti in Indian music, especially, Carnatic music. They have to be trained not merely to shine as brilliant performing artists in future, but also to behave in a manner that would elevate them to higher spiritual planes of existence. Sangeeta can only be experienced and enjoyed when it comes along with true bhakti. No matter how much a student or musician excels in Carnatic music, they would never be able to lay their hands on the actual treasure, which, indeed, lies within them. Consciously letting go of negatives within the mind and approaching the subject of music with a pure, untainted heart, is the only way to discover the amazing, unending, wealth that music really is. So let us get back again to that wonderful kriti, ‘Sangeeta jnanamu’, contemplate on it and commence our new journey towards bhakti-oriented music. The article aptly brought out the true essence of music. In this competitive and materialistic world, we, the inhabitants of the earth in the 21st century are being forced to face great dilemma. Especially those who are genuinely touched by the Sangeetha Rasasvada, they are the ones who face greater conflicts of having to face small minds that do not understand but try to use music to better their smaller selfs, as against the former who try to better the larger inner selves. Needless to say who will be the winner.